In late September, the University of Colorado School of Medicine in Aspen will host its last biomedical conference at the Given Institute, in a building designed as a think tank in 1972 by modernist architect Harry Weese. 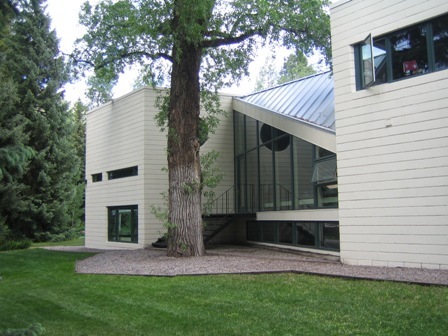 The institute was a gift to the university by the late Elizabeth Paepcke, who with her husband Walter, set the post-war direction for the city by establishing the Aspen Skiing Company, the Aspen Music Festival and the Aspen Institute. The couple recruited Bauhaus masters Walter Gropius and Herbert Bayer in the late 1940s to articulate a bold new future for the worn-out mining town. They later inspired works there by Eero Saarinen and Marcel Breuer, among others. Saarinen's Aspen Music Center, a tent created for the 1949 Goethe Bicentennial Convocation, lasted until 1963. Breuer's residential design has been altered and added onto so much that today it's unrecognizable as his own. Now Weese's auditorium is threatened with demolition, a victim of changing times and economic necessities. "The university is strapped. Funding -- state support -- has decreased dramatically," said Dan Meyers, communications director at the school. "The medical school itself is a billion-dollar operation. Of that a total of $10 million comes from the state. It places us under pressure. There have been no raises for faculty." Meanwhile, the school is pouring about $200,000 a year into maintenance for Weese's aging modernist gem. Meyers said a $5 million fundraising effort, aimed at bringing the building up to date by making it ADA compliant and usable year-round, fell short. In late August, city council abandoned a plan to save it by putting its purchase up for a vote by Aspen citizens, saying the price was too high. Potential buyers have expressed no interest in the building itself, Meyers said. But the school is seeking to fetch as much as $15 million for the two-and-a-quarter-acre site on which it stands, overlooking Hallam Lake, just a short walk from downtown. Their intended next step, once city council reviews their permit on Sept. 22, is demolition. "The property is zoned r-6, which allows single family homes and duplexes," said Amy Guthrie, historic preservation officer at the City of Aspen. Though she's uncertain how many homes could be built, there is the opportunity to subdivide into multiple lots. The city has a growth management system that could limit the number of development rights granted. The proposed demolition not only has raised the eyebrows of the locals, but invited comments from a larger community of architects and historians across the nation as well. "I always thought that Harry Weese was an excellent architect," said Richard Meier in New York, acknowledging that he had not yet seen the Given. "I know his work is thoughtful and extremely well-planned out, and I'm sure it's a building of quality. I'm surprised that the school would think of tearing it down." Martin Wolfe, a principle at Solomon, Cordwell, Buenz in Chicago, was more pragmatic. "If there's a way to use historic buildings to further the university's mission, fantastic," he said. "But if you're hampered in trying to reuse it, the intelligent road is not always easy or clear. The last thing you want is a group of buildings sanctified but not used, or not useful in a way society's moving." Stanley Tigerman, who once worked in Weese's Chicago office, was decidedly realistic. "This is a difficult time, not just for the individual, but for institutions experiencing financial difficulties," he said. "There were a lot of Louis Sullivan buildings demolished in Chicago a long time ago -- but Harry Weese is not Louis Sullivan. The Given Institute is not the best of his buildings, not by a damn sight. Do you save every Harry Weese building?" He has a point. Weese is better known for the Time-Life Building in Chicago, where he clearly enjoyed following the principles of Mies van der Rohe but injected his own perspective there too. His Metropolitan Correctional Center, also in that city, is a sculptural, humanitarian design wrapped in a 27-story, triangular-shaped, cleverly fenestrated skyscraper. And his work in Louisville -- transforming an 1837 bank (across Main Street from one of Mies's last designs) into the delightful Actors Theater, as well as turning old warehouses into wide-open corporate offices for Brown-Forman Corporation -- remains some of the best in that city of very fine architecture. But it's his 1969 design for the vaulted subway stations of the Washington, D.C., Metro system that is the crown jewel of Weese's career. "The Metro established Harry Weese & Associates as the country's foremost architectural designer of rail transit systems," wrote Kathleen Sklolnik in Robert Bruegmann's upcoming book, The Architecture of Harry Weese. Bruegmann, an architectural historian and professor at the University of Illinois at Chicago, sifted through hundreds of Weese's designs as he prepared his retrospective of the architect's 30 best works, due out from Norton Professional Books in October. "It's not his biggest, his best or his most well-known," Bruegmann said of the Given. "But it was always on our list." By his reckoning, it's an iconic symbol of the cultural impetus wrought by the Paepcke family in Aspen. "It's all of a piece," he said. "To destroy any part of it is to destroy the entire intention of what the Paepckes wanted and what Weese actually accomplished." He views the Given as typical of Weese as architect. "He subordinated himself to the design of the building," he said. "It was characteristic of him -- of doing the right thing for the place itself. He respected the landscape -- it's nestled in a modest concrete block building that's one of the most ingenious Harry ever devised." The building responded to the needs of its primary users. "For what it was meant to do, he made it a spectacular thing," said Aspen architect Harry Teague. "It's a circular auditorium, like the famous operating theaters of old, in the round, with steep banks. He was relating to the doctors." Its demolition, Bruegmann said, represents more than just another modernist structure biting the dust. "There's a stewardship opportunity here that's far more important than the few million [the school] would get for the property," he said. "They're not tearing it down for something better -- they're just tearing it down. It's a poster child for cultural vandalism." Architect Sarah Broughton, vice chair of the Aspen Historic Preservation Commission, said the Given established its legacy as a meeting place for doctors and scientists long before the advent of the Internet. "Scientists came here to talk about cutting edge things," she said. "It's part of the whole Aspen mindset of mind, body and spirit, of nature and science and culture in a small town." Believing it should be preserved as one of the most significant buildings in Aspen, her organization applied in June to have it listed with the National Register of Historic Places. A grassroots group has sprung up with a Facebook page, to try to raise funds to save it. Their biggest obstacle may be the $15 million price tag placed on it by the university. "It's so high it's prohibitive," Broughton said. "I've been in a lot of meetings to save it. The hard part is to find the means. Off-the-table discussions are about such a big price tag -- it over-exceeds the value of the land." The real value of the Given Institute, though, lies not with the dollar figure set by the University of Colorado School of Medicine for the purchase of its property. Certainly, its officials believe its price is justified: its doctors need to be educated and its professors retained, all for the common good. It makes a strong case for seeking the best price the market will bear, during the most economically challenging times since the Great Depression. And as architect Tigerman argued: "Where does saving a building versus saving yourself begin?" It's a most rational question, especially when discussing an institution dedicated to the preservation of human life. Consider also the value of the Given as viewed within the context of Harry Weese's entire body of work. (It's unfortunate to note that other Weese buildings are also threatened now -- on the campuses of Beloit and Williams Colleges and at The University of Wisconsin). Where does the Given rank in comparison to all of his buildings -- in Chicago, Washington or even Columbus, Ind.? It certainly bears the sensitive, humanist and one-of-a-kind stamp of each of his designs, but it does not rise to the level of his very finest. Indeed, of the 30 projects in Robert Bruegmann's excellent book, the Given is among the lesser. No, the real value of the Given Institute will be defined in coming weeks by the citizens of Aspen. It is of that place. It may belong legally to the university, but it is uniquely the community's -- created by visionaries who laid the foundation for the city that exists today. It signifies Aspen's own special culture, perched up there in the rarified air atop the western slope of the Rockies, articulated by some very forward-looking individuals and a highly sensitive, well-informed architect. To find a way to save it would mean acknowledging it as an integral part of the community's fabric and soul. To allow its demolition would mean watching one of the city's own touchstones crumble in a cloud of dust. "It would be a sad day for Aspen," Broughton said. "It would mean the loss of history, of our continuity with history." Amy Guthrie, preservationist from the City of Aspen, has another perspective. "It's not over 'till it's over," she said. "But if it goes away, it's a wake-up call about the importance of protecting these places. When it's gone, it's gone." [Author's note: Late on Wednesday afternoon, September 8, Aspen City Council called a meeting to review the first reading of an emergency ordinance to rezone The Given Institute property from R-6, Residential to A, Academic. The only allowed uses in the Academic zone district are those related to education, cultural activities, and research. The first reading was approved.